1. Create a QR code using a code generator. Pick the website of your choice for the target. 2. Save the image (larger the better) and open it in Photoshop. 3. See how far you can go modifying the image. Check out the second half of this tutorial for some suggestions. Look here for some examples of innovative QR code use and design. Then craft TWO QR code designs that link to a website or resource. 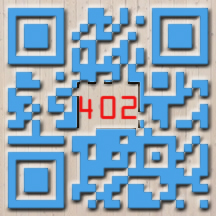 Customize the QR code to reflect the nature of the target. Linking to NYC.com – use the Manhattan skyline. Apple.com? Add the Apple logo. Your own website? Use your face or your initials. You can test your QR code by using your phone’s app, an iPod touch with app or go to http://www.onlinebarcodereader.com/ and upload it to the website to test it.